Oh great! I got it. From tomorrow morning, I will have a positive outlook towards everything, I’ll have a positive attitude and I am happy. It isn’t that easy, isn’t it? If it were, all people would have read autobiographies, self-help books and developed great attitudes that make them the next leaders and the innovators. Unlike other qualities, Attitude is something that cannot be copied, it can only be developed. By closely observing or by reading a book, one may copy the behaviour of the likes of a Gandhi or a Richard Branson, but that is not attitude. Attitude is the layer beneath your outlook and all your actions – proactive and reactive – in your life. Attitude is something that comes from your inside. It is what determines the skeleton of one’s character. Attitude is only developed with real life experiences and the learning that feeds back into the system. It is under constant change, and the way it changes also depends on the attitude towards the change. 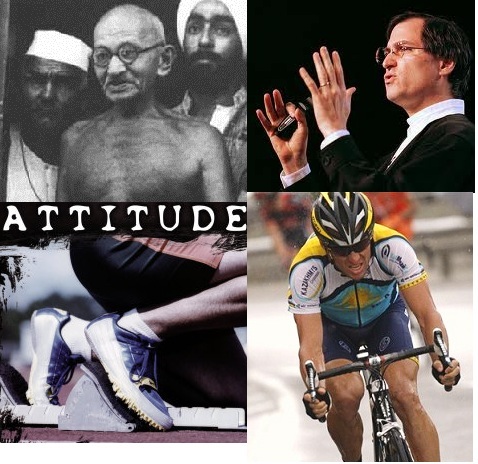 In my view, attitude is the most important element of life. Because, your attitude determines your actions, your attitude determines how you look at a situation. One of the things that I learnt in life is – the best way to live life is to follow truth. A mind of truth is always open, because you’re craving to know the truth and learn the truth. One cannot have an open mind without being true. It is very easy to get deceived that one has an open unbiased mind without being completely true, because your mind can deceive you of truth as what you believe as true.